Sub-compact CUVs are considered gateway products in the auto industry; vehicles that attract new buyers whom, if satisfied, will trade up within the same brand when the time comes. They also appeal to folks at the other end of the age range, looking to downsize. Industry forecasts call for this emerging class of vehicles to explode from a few thousand sold in 2013 to more than two million in the next few years. Accordingly, manufacturers are rushing to get into the game – witness the Mazda CX-3 which is just now coming to market. At Honda the newcomer is the HR-V.
Based on an extended version of the same global platform used for the Fit and rolling off the same assembly line in Mexico, the HR-V is slightly larger than the Fit yet much smaller than its CR-V sibling. At a distance the HR-V shares many styling cues with the CR-V. But, as I get closer I notice little details like the handles for the rear door incorporated in the blacked-out C-pillars helping give the appearance of a tall and boxy coupe. While the HR-V is almost 30-cm shorter overall than the CR-V its wheelbase is only 2-cm less. That extra space makes for a lot of legroom in the second row, much more than expected from something this size and any of the competition. With the second row seats folded perfectly flat into the low floor there is an amazing 1,665 litres of cargo space, more than some larger SUVs. Even with the second row seats in place the HR-V outdoes anything in the class with 665 litres of cargo space in the back. 2016 Honda HR-V - Since the HR-V uses the same global platform as the Fit, with its centre-mounted fuel tank, the impressive cargo-carrying capabilities that set the subcompact apart are also featured in the HR-V. The rear seatbacks fold flat to create a spacious, flat cargo deck, which can be extended for longer items by folding forward the front passenger seat. In that mode, items up to two metres in length can be accommodated – and rear liftgate can still be closed. But the frosting on the cake is the Fit-like reconfigurable second-row “Magic Seat”. It can be folded up for unprecedented floor-to-ceiling cargo height. The back of the front passenger seat can also be folded flat for accommodating extra long items. This may be a sub-compact CUV on the outside but it is a compact one on the inside with more rear seat and cargo space than any of the others. The interior is straight out of the new Fit, with higher quality surfaces and a taller seating position that provides excellent visibility in all directions except for the rather large C-pillars which block the rear quarters. The three-dial “floating” instrument cluster has the speedometer in the middle, the tachometer on the left and a configurable multi-gauge readout to the right. The rings around the gauges vary in colour depending on the activity of your right foot, changing from green to blue. A large colour screen that shows navigation, infotainment and rear view camera info sits atop the centre stack which is part of a two-tone treatment that lightens up the interior. The centre console, topped by a sliding armrest is especially roomy. The depth of the cup holders can be adjusted to suit different sizes and there is space in the forward portion of the console to accommodate cell phones and similar items. There are also USB and other ports in that space as well but they are all but hidden from view. Instead of the 1.5-litre engine used in the Fit, the HR-V gets the larger 1.8-litre four-cylinder from the Civic. Producing 138-horsepower in this application, it is paired with a six-speed manual or CVT automatic shared with the Civic and Accord. The engine is smooth and extremely quiet, so much so that one might not notice it running at idle. While others in the class might boast more power on paper, the HR-V is lighter than they are, despite all that extra space inside, allowing it to perform at or near the top of thr class. The CVT is one of the better examples of a disliked breed. Like the others it takes the joy out of enthusiastic motoring under sustained open throttle applications. But, it has been cleverly programmed to simulate seven distinct 'gears', allowing the engine to rev to its power peak before changing ratios, when 'shifted' via steering-wheel-mounted paddles. This way it's possible to escape the droning, motor-boating sound common to engines saddled with a CVT. The HR-V comes in front or all-wheel-drive configurations, the latter the latest version of Honda’s Real Time AWD. The “Intelligent Control System” is programmed to send more power to the rear wheels than in the CR-V in order to provide more rear-drive out of corners and an enhanced driving feel. The HR-V comes with a full suite of safety features including a new generation of the company’s Advanced Compatibility Engineering (ACE) front body structure, Hill Start assist, Expanded View Driver’s Mirror; multi-angle Rearview Camera and an electric parking brake with auto hold. 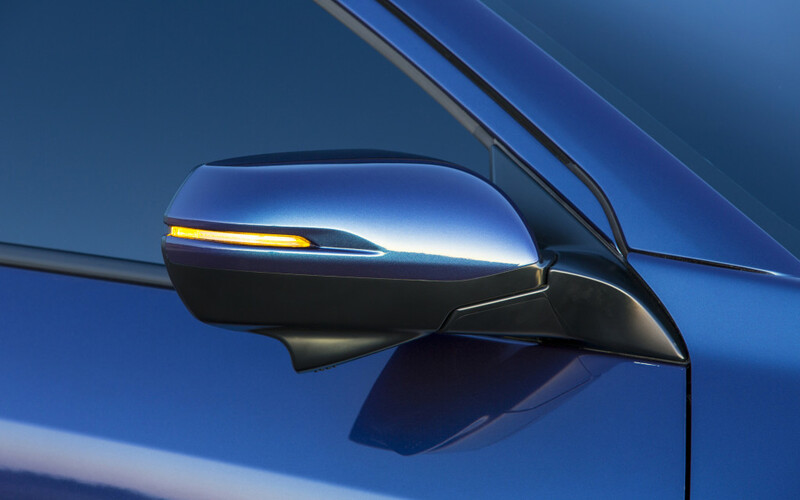 2016 Honda HR-V - Using a camera mounted under the right-hand exterior mirror, an image of the blind spot area beside the car is displayed on the centre-stack screen when the right turn signal is activated. (It can also be activated by a switch.) The camera scans an area about 50 metres behind the vehicle and about 20 degrees off the rear quarter. It’s ideal, not only for checking for vehicles, but also for pedestrians and cyclists moving up on the right side of the HR-V.
Higher trim levels get Lanewatch Assist with the camera in the passenger side mirror reporting on objects in the right-side blind spot. Standard equipment on all models includes heated front seats, automatic climate control, power windows and locks, remote keyless entry, 17-inch alloy wheels, power heated mirrors, front wiper de-ice pad, rearview camera, tilt and telescoping steering wheel with audio and cruise controls, wireless connectivity and display audio with 15-cm touch screen. The HR-V is scheduled to go on sale in Canada on July 10, 2015.